The official delegates from each country gather and adopt the declaration. The World Party aims to be a pillar to establish and maintain the authority of the World Federation. Basically, strength of the pillar is based on the World Party Declaration. Basic rule of World Party Convention is as follows. 1. The Convention is recognized regardless of the number of attendants as far as the Convention is noticed at least 1 year before the Convention and the venue is not difficult to access. The venue for the Third Convention was decided as Nepal at the end of 2017. 2. Seats are apportioned in proportion to population. Total seats are basically 1 thousand. The seats of the Convention is shown in the Branch List of World Party. 3. Members from each branch must get registered at least 1 year before the Convention. 4. Members 3 times as many as the apportioned seats can be registered. 5. From among the registered members, each branch can send the official delegates following the seats apportioned. 6. In the case of Nepal where the Third World Party Convention will be held in 2019, population in 2015 is 28,514.0 thousand while the world population is 7,349,472.0 thousand. So the votes are 3.88. The first decimal place is not zero, so it is rounded up to 4.00. So the seats are 4. So, the World Party Nepal may register 12 members (4 x 3 = 12). From among these 12 members, 4 delegates may attend the Convention as the official delegates. For the detail, please see the World Party Statute. 7. If there are problems in the registered members, other registered members can object to the registered members. If the objection reaches 5 percent of total votes of registered members, the objected members must be removed from the registered members. But, in the World Party Convention, if the objected member gets the recognition from more than half of delegates, the objected member can remain the registered member. So, there is no corruption in the World Party. 8. The vote of delegate cannot be entrusted. Namely, only attending delegates can have the vote. So, if a branch that has 50 votes sends only 10 delegates, the votes of the branch are 10. 9. The number of votes of each branch is written in Article 14 Votes of Delegate of World Party Statute. The below is the case that the attending country is five. The number of the theoretical maximum vote of each country shall be 100 / 5 = 20 percent of the total votes. For example, if the country A sends 5 delegates, the country B sends 10 delegates, the country C sends 15 delegates, the country D sends 30 delegates, and the country E sends 40 delegates, the total delegates are 100. So, the number of the theoretical maximum votes is 100 / 5 = 20. So, 15 delegates of the country C is less than the number of the theoretical maximum votes and the closest to the number of the theoretical maximum votes among the countries whose delegates are less than the number of the theoretical maximum votes 20. So, the number of the maximum votes of each country shall be 15. So, from the country D and E, only 15 delegates may be accepted. Thus, inappropriate registered members are removed by other registered members. This system keeps the authority of World Party Convention. For more detail, please read World Party Statute. In the Convention, the President is elected, basic policy of World Party is identified, and the World Party Declaration is adopted. Furthermore, World Citizen Network Convention will be held on the same day or the next day. Please visit the page for the World Citizen Network Convention. As shown in the figure below, on the first stage, the policy of World Party is to establish the World Parliament. Apportionment of delegates in the figure below is not the latest one. The latest apportionment is shown in the Branch List of World Party. Basic thought of the World Party is based on a paper "International Party for the World Government". Basic policy is to directly elect the delegates of each country in proportion to population and send them to the World Parliament. The World Parliament that is proposed in the above paper is composed of 2 houses, and each house has basically 1 thousand members. But the World Parliament that is proposed by the World Party has only 1 house that has basically 1 thousand members. Delegates from each country are apportioned in proportion to the population of each country. On the first stage, World Parliament is a consultative assembly without the legislative power. It is like the European Parliament. After getting the legislative power, it will establish the Constitution of the World Federation. World Federation is a worldwide federation of independent countries, and the World Government is the central government of the federation. World Government is concerned with the administration of military force, the control of currency, and other issues that cannot be solved by each country alone. Matters such as religion, political and economic system such as liberalism or communism, industry, agriculture, commerce, science, arts, and so on are free for each country. So, countries in the federation can declare either liberalism or communism. There are some conditions for attending the World Parliament. 1. Delegates to World Parliament have to be directly elected by people. If delegates are sent without election, they are not accepted as the official delegates. They can attend as observers. 2. Members from each country must get registered to the international secretariat of the Parliament at least 1 year before the opening of the Parliament. 3. A country can have registered members 3 times as many as the number of seats in the Parliament. For example, if the seats of a country in the Parliament are 10, the country can have 30 registered members. From among these 30 members, the country can send 10 delegates as the official delegates. 4. The vote of delegate cannot be entrusted. Namely, only attending delegates can have the vote. So, if a country that has 10 votes sends only 5 delegates, the votes of the country are 5. 5. Basically, the maximum number of votes of each country is similar to that of the World Party Convention. The way of calculation is shown in Article 8 Votes of Each Country in the World Parliament Statute. For example, bellow is the case that attending countries are 5. The number of the theoretical maximum vote of each country shall be 100 / 5 = 20 percent of the total votes. For example, if the country A sends 5 delegates, the country B sends 10 delegates, the country C sends 15 delegates, the country D sends 30 delegates, and the country E sends 40 delegates, the total delegates are 100. So, the number of the theoretical maximum votes is 100 / 5 = 20. So, 15 delegates of the country C is less than the number of the theoretical maximum votes 20 and the closest to the number of the theoretical maximum votes among the countries whose delegates are same as or less than the number of the theoretical maximum votes. So, the number of the maximum votes of each country shall be 15. So, from the country D and E, only 15 delegates may be accepted. For more detail, please see the World Party Statute and the World Parliament Statute. 6. If there is a problem in a registered member, other registered members may object to the registered member. For example, if a registered member was not directly elected by people, other registered members can object to it. When a registered member objects to another registered member, the member who objects shall send a document of objection with her or his name and clearly specified reason to the President of World Parliament. If the objections reach 5 percent of total votes of all the registered members, the President shall send the documents to each registered member, and a motion to remove the objected registered member shall be made in the session of the World Parliament. In the session of the World Parliament, when the attending delegates, with more than half of the total votes of attending delegates, object to the removal, the objected registered member shall not be removed. Otherwise, the objected registered member shall be removed even if the objections by document are only 5 percent of total votes of registered members. In the process of voting for removal also, the maximum number of votes of each country is stipulated in Article 8 Votes of Each Country in the World Parliament Statute. For the detail of calculation, please see the Statute. There are some similar points in the conditions for the World Party Convention and those for the World Parliament. The most important point is that the registered members can remove other registered members. By this system, registered members who are inappropriate for maintaining the world democracy are removed. So the authority of World Party Convention and the World Parliament is maintained. For more detail, please see World Party Declaration. The official delegates from each country gather and adopt the declaration. The World Party aims to be a pillar to establish and maintain the authority of the World Federation. Basically, strength of the pillar is　based on the World Party Declaration. Basic rule of World Party Convention is as follows. 1. The Convention is recognized regardless of the number of attendants as far as the Convention is noticed at least 1 year before the Convention and the venue is not difficult to access. So, the venue for the Second Convention must be decided by the end of 2013. 3. Delegates from each branch must get registered at least 1 year before the Convention. 4. Delegates 3 times as many as the apportioned seats can be registered. 5. From among the registered delegates, each branch can send the official delegates following the seats apportioned. 6. In the case of Bangladesh where the Second World Party Convention will be held in 2015, population in 2011 is 150,494.0 thousand while the world population is 6,950,737.8 thousand. So the votes are 21.65. The first decimal place is not zero, so it is rounded up to 22.00. So the seats are 22. So, World Party Bangladesh may register 66 members (22 x 3 = 66). From among these 66 members, 22 delegates may attend the Convention as the official delegates. For the detail, please see the World Party Statute. 7. If there are problems in the registered members, other registered members can object to the registered members. If the objection reaches 5 percent of total votes of registered members, the objected members must be dismissed from the registered members. But, in the World Party Convention, if the objected member gets the recognition from more than half of delegates, the objected member can remain the registered member. So, there is no corruption in the World Party. The maximum number of vote of individual branch is up to 20% of total votes of attending delegates. For example, if the total votes of attending delegates is 500, 500 X 0.20 = 100 votes are the maximum votes which each branch can have. If the number of attending countries is 5 or more, this criterion has no problem. But if the number is less than 5, this criterion should not be applied. This is explained as follows. In case that only 2 countries attend, if country A sends 300 delegates and country B sends 200 delegates, total delegates are 500. So, the maximum votes are 500 x 0.20 = 100. But, in this case, the maximum votes should be 200 because the country B sends 200 delegates. Thus, new criterion is necessary for the case that attending countries are less than 5. The new criterion is written in the draft of the World Party Statute. This draft is to be adopted in the Second World Party Convention. So, we need agreement in advance if we apply this new criterion. For the detail of new criterion, please see Article 14 Votes of Delegate in the Draft of World Party Statute. This problem of the maximum votes of each branch has to be made clear before the Convention. Thus, inappropriate registered delegates are dismissed by other registered delegates. This system keeps the authority of World Party Convention. For more detail, please read World Party Statute. 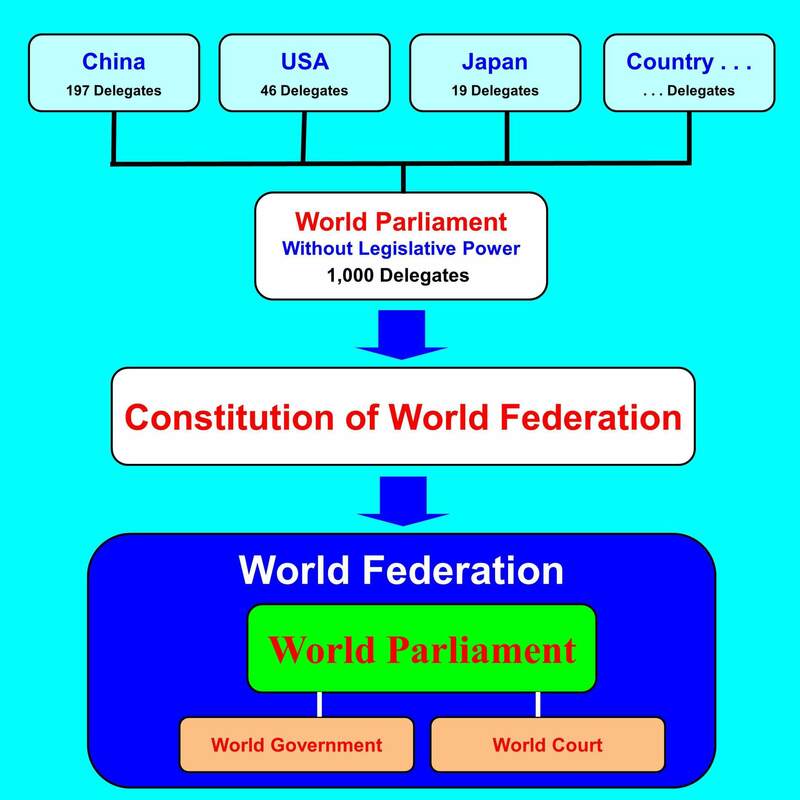 As shown in the figure below, on the first stage, the policy of World Party is to establish the World Parliament. Basic thought of the World Party is based on a paper "International Party for the World Government". Basic policy is to directly elect the delegates of each country in proportion to population and send them to the World Parliament. The World Parliament that is proposed in the above paper is composed of 2 houses, and each house has basically 1 thousand members. But the World Parliament that is proposed by the World Party has only 1 house that has basically 1 thousand members. Members from each country are apportioned in proportion to the population of each country. On the first stage, World Parliament is a consultative assembly without the legislative power. It is like the European Parliament. After getting the legislative power, it will establish the Constitution of the World Federation. World Federation is a worldwide federation of independent countries, and the World Government is the central government of the federation. World Government is concerned with the administration of military force, the control of currency, and other issues that cannot be solved by each country alone. Matters such as religion, political and economic system such as liberalism or communism, industry, agriculture, commerce, science, arts, and so on are free for each country. So, countries in the federation can declare either liberalism or communism. There are some conditions for attending the World Parliament. 2. Delegates from each country must get registered to the international secretariat of the Parliament at least 1 year before the opening of the Parliament. But the registration for attending the Parliament is accepted even on the day of the Parliament. 3. A country can have registered delegates 3 times as many as the number of seats in the Parliament. For example, if the seats of a country in the Parliament are 10, the country can have 30 registered delegates. From among these 30 delegates, the country can send 10 delegates as the official delegates. 5. Basically, the maximum number of votes of each country are 20 percent of total votes of attending delegates. This criterion is similar to that of the World Party. For more detail, please see the World Party Statute and the World Parliament Statute. 6. If there is a problem in a registered member, other registered members may object to the registered member. For example, if a registered member was not directly elected by people, other registered members can object to it. When a registered member objects to another registered member, the member who objects shall send a document of objection with her or his name and clearly specified reason to the President of World Parliament. If the objections reach 5 percent of total votes of all the registered members, the President shall send the documents to each registered member, and a motion to dismiss the objected registered member shall be made in the session of the World Parliament. In the session of the World Parliament, when the attending delegates, with more than half of the total votes of attending delegates, object to the dismissal, the objected registered member shall not be dismissed. Otherwise, the objected registered member shall be dismissed even if the objections by document are only 5 percent of total votes of registered members. In the process of voting for dismissal also, the maximum number of votes of each country is, basically, up to 20 percent of total votes of attending delegates. For the detail of calculation, please see the Statute. There are some similar points in the conditions for the World Party Convention and those for the World Parliament. The most important point is that the registered delegates can dismiss other registered delegates. By this system, delegates who are inappropriate for maintaining the world democracy are dismissed. So the authority of World Party Convention and the World Parliament is maintained. For more detail, please see World Party Declaration. for that. There is a bank account for donation, Finance of Institute. This is an account of the World Government Institute Japan. Please send donation. We want to invite the delegates to the Convention as many as possible. When supporters send the donation, legal problem may occur if the amount of donation is not small. Especially, international donation may cause problem. We will solve this problem in the future. First World Party Convention was held in Accra, Ghana on 12 August 2011. The Convention is the supreme body of the World Party. The seats of the Convention are one thousand, and they are apportioned in proportion to population of each country. The seats of the Convention is shown in the Branch List of World Party. The Convention is recognized regardless of the number of participants as far as the Convention is noticed at least one year before the Convention and the venue is not difficult to access. Each branch can register three times as many as the official delegates. From these registered delegates, each branch can send the official delegates. Registered delegates from each branch must get registered at least one year before the Convention. So, only the members who had got registered by 11 August 2010 could participate in the Convention as the official delegates. If there are problems in the registered delegates, other registered delegates can object to the registered delegates. If the objection reaches 5% of total vote, the objected delegates must be removed from the registered delegates. In this case, if the objected delegate gets the recognition from more than half of the registered delegates, the objected registered delegate can remain the registered delegate. So, there is no corruption in the World Party. In case of World Party Ghana, the seats were 3.49. The first decimal place was not zero, so it was rounded up to 4. So World Party Ghana could register 12 delegates (4 multiplied by 3 is 12). From among these 12 delegates, 4 delegates could participate in the Convention as the official delegates. For more detail, please see the World Party Statute. The above is the photo of the Convention. Participants of the Convention were the two official delegates of World Party, one World Party member, and three other participants. The official delegates were Mr Toshio Suzuki, World Party Japan and Mr Nashiru Abdulai, World Party Ghana. Another World Party member was Mr Karl A.Y. Kpodo, World Party Ghana. Three other participants were Mr Iddrisu Safianu, Ms Diana Anyidoho, and Dr Kwaku Osafo. The below is two official delegates, Mr Toshio Suzuki, World Party Japan and Mr Nashiru Abdulai, World Party Ghana. An inappropriate member was dismissed. He declared the doctorate but did not send the copy of certificate and the date of birth. Furthermore, he wrote an article that suggested the website "w-g.jp" is under his control. These issues were carried out by the two official delegates. Besides these issues, Dr Kwaku Osafo and Mr Karl A.Y. Kpodo delivered speech. World Citizen Network Convention was involved in the World Party Convention. Dr Kwaku Osafo gave us advice to promote World Party. Mr Karl A.Y. Kpodo spoke on the sovereignty. After speech, we discussed many things. The President was decided and the address of headquarters is the address of the President's home. But, in the future, the Statute can be amended, the President can be changed by election, and the headquarters also can be changed. There were two important things. One was on the effect of the US troop that is staying in many countries. I (Toshio Suzuki) did not know that US troop is staying in Ghana, and Ghanaian people did not know that US troop is staying in Japan. Many people think that existence of US troop is not so important because the US troop does not intervene into the politics of each country. But, we can understand the effect of US troop by considering the case of Korean peninsula. In Korean peninsula, there are North Korea and South Korea. People of these country are same, and they are hoping for the unification of both countries. North Korea is under dictatorship, but South Korea is under democracy. This difference is due to the existence of US troop. Same thing can be said for some other countries like Japan, Taiwan, Afghanistan, etc. For example, if the US troop leaves Japan, Japan may return to the militarism. In the future, in my opinion, international political party like World Party will have the power to maintain the democracy without the US troop because the international convention of international political party like the World Party Convention is a very strong authority. Another important thing was that World Party Japan is aiming to abolish the Emperor System. Some Ghanaian people worried about this. Actually, at present in Japan, there is no strong opinion to abolish the Emperor System. But, in present Japan, bankruptcy of national finance is approaching. If people want the reconstruction of national finance, public opinion will reach the abolition of the Emperor System. In a word, the Emperor System is the state slavery. There have been some bankruptcies of national finance in the history of Japan. At that time, Emperor was ruling the society indirectly. Namely, Emperor appointed the head of Shogunate, the Shogun. The Shogunate was the feudal government of Japan ruled by Samurai, warrior in the feudal age. Bankruptcy occurred under this regime. This is essentially same in the present age. There is the Imperial Palace in Tokyo. This is surrounded by huge buildings of big companies, government offices, and the National Diet. Companies around the Imperial Palace are representative companies of Japan. Executives of these companies are exchanging information and opinion. They are leaders of the business world of Japan. These executives, government officials, and politicians are in close relation each other. Policy of these people are essentially same as that of the feudal age. Namely, national debt is accumulated by their policy and bilked. So, the national finance of Japan cannot be reconstructed without abolishing the Emperor System. In the near future, savings of diligent people will be bilked. So we must call the Emperor System the state slavery. There is another reason that the Emperor System must be abolished. If US troop leaves Japan, the political situation is same as that of prewar period. Namely, prime minister may be murdered, and the militarism may come. After the abolition of the Emperor System, Emperor will exist as the head of religious corporation in the private sector. Necessary fund will be provided for it. The Convention was possible by the help of Mr Nashiru Abdulai and Mr Karl A.Y. Kpodo, World Party Ghana. I am very much thankful for their contribution. With regard to donation, Mr Takeo Nakamura donated 22,000 yen to the World Government Institute and 7,000 yen to the World Party. But, in the Monthly Report for August, I wrote that he donated 32,000 yen for the Institute. This was my mistake. So I donated 10,000 yen. So, the total donation was 39,000 yen, and this was 486 dollar. The donation was handed to Mr Nashiru Abdulai. He can take the remain as the salary for his work. But, he must write a report on the revenue and expenditure by the end of 31 March 2012.